Explanation: The last 10 days have been great days for SOHO, the space-based SOlar and Heliospheric Observatory. Contact was completely lost with this international research spacecraft over 3 months ago but recovery teams have reacquired control of SOHO and, beginning October 5th, have been successfully switching on its scientific instruments. This October 13th view of the Sun in the light of ionized Helium atoms was recorded by the restored EIT instrument. It shows bright active regions and lofty prominences above the solar limb. North is toward the left rather than the top as the spacecraft's orientation has not yet been fully adjusted. (For a full Sun / full resolution view, click on the picture!) 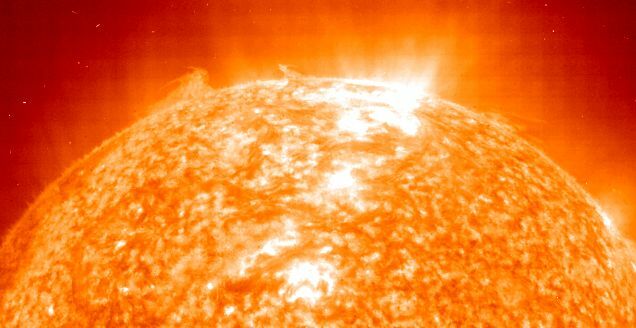 With the solar cycle approaching a maximum in the coming years, excitement continues to build as it becomes very likely that SOHO will be able to resume its unprecedented exploration of solar phenomena.